A Million Little Bricks: The Unofficial History of the LEGO Phenomenon, by Sarah Herman is a book I picked up to read for work. There's nothing like running a LEGO shop and having all of your young customers know more than you do to compel you to find out more about the history of Lego! Ha! I'm really not sure that I have too much of a review to offer on this book, per se. Mostly I wanted to note that I read it for my own list making purposes. A Million Little Bricks offers a rather comprehensive overview of the history of this much-loved brand. With glossy pages and colored photographs, it's easy and entertaining to track with in order to learn about the various Lego lines and directions which the company has branched out into. Author Sarah Herman starts at the very beginning, telling the reader about how the company got started and what prompted the owners to create the brick in the first place. She proceeds by explaining the variations and themes which Lego has taken up all the way to the present day (or, specifically, to 2012). Anything and everything you've wanted to know about Lego, Herman covers with enthusiasm. I confess that I don't feel quite the die-hard fan in relation to her. I like the brick and all (obviously) but mostly I just think the toy is fun and cute to play with and offers more creativity than any other toy on the market. I enjoy building with them myself and have my particular preferences as to the ones I care to collect. One of the many awesome things about Lego is that it appeals to all people, universally, at almost any age. You never have to outgrow it. Lego is there to be enjoyed long term! On this, author Sarah Herman and I see eye-to-eye. The shared love of Lego definitely exists between us and I appreciated her passing along some knowledge of its history to me. 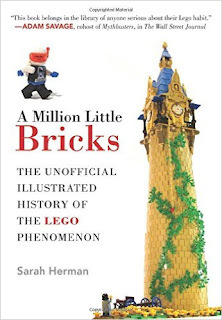 A Million Little Bricks is a handy resource if you feel the need or want to brush up on your Lego facts and history. It's also a great gift idea for the Lego lover in your life who thrills in their knowledge of the company and lines. This is a fun book, being bright and cheerful, and it makes for easy reading. If you're looking for a Lego title, this is definitely one to consider. My kids were Lego fans long after other toys were put away and forgotten. One even credited his ability to put together boxed furniture to having built with Legos. :-) I don't know that any of us would read a book about their history, but it's nice to know there is a good one out there if we want to.